We love setting up the walled garden for Christmas and can’t wait to share the magic on Saturday 12th December from 11am – 5pm. For Christmas foodie fans, it doesn’t get much better, with toasty soups, sausages, roast chestnuts, mulled fruit juices (and tea/coffee). Marion’s Mince Pies are a must and as always, our cake stalls will be loaded with delicious cakes to eat or take away. Sarnia Accordian Group will play from 2.30pm – 3.30pm and then the sound of Christmas will ring out over the garden with the Ladies College Hand Bell Ringers from 3.45 – 4.15pm. 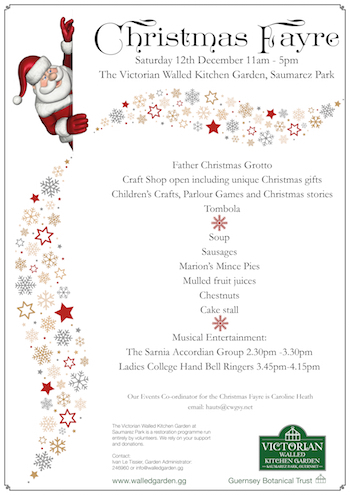 Children will be delightfully entertained with Father Christmas’s Grotto, playing parlour games, making Christmas crafts, and trying their hand at our Christmas Lucky Dip. Christmas stories will be read at 11am, 12noon, 1pm, 2pm and 4pm. Adults and children can all enjoy a traditional Tombola and a mooch around in our fascinating Christmas Shop where we have lots of unusual Christmas gifts, most of which you won’t find anywhere else on the island. Entry to the garden is free and donations are welcome. 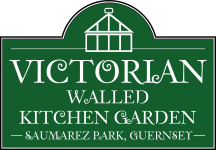 Money is needed to help the garden grow and flourish, so please come along and enjoy our unique walled garden at Christmas time. Your support funds our green shoots next year. Just click on the photo to enlarge our poster.